Even though we take pride in caring for your vehicle whenever it needs major repairs, we understand that a repair shop is probably not a place you look forward to visiting. That's why you can trust Superior Transmission & Auto Repair for complete maintenance services whenever your vehicle needs a checkup. We'll help you keep the cost of unexpected repairs down with regularly scheduled maintenance. 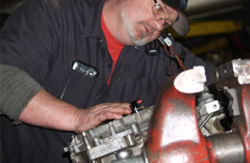 Ask us about our complete preventive maintenance program for your vehicle. When you have qualifying repairs completed on your car or light truck, we'll guarantee them for 6 months or 12,000 miles, which ever comes first. Superior Transmission & Auto Repair be your auto care provider of choice. Our technicians strive to get your vehicle fixed fright the first time and we gladly stand behind our work with our Peace of Mind warranty. As always, your complete satisfaction is our goal!